Please refer to our stock # 1846 when inquiring. 19th Century Ottoman Empire Marble Water Spout, Turkey, ca. 1880. 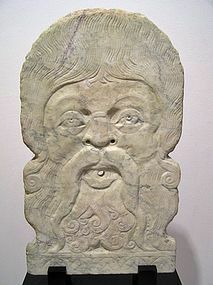 In the form of a male with curly hair, beard, and long mustache. Central void in mouth of male for water fountain. One crack has been stabilized as seen in photo, but otherwise in very good condition. Marble is 18 3/4" x 11" x 1 1/2". On custom stand size is 21 1/2" x 12 3/4" x 5 1/2". In the 19th Century the Christian population of the Ottoman empire, owing to their higher educational levels, started to pull ahead of the Muslim majority, leading to much resentment on the part of the latter. In 1861, there were 571 primary and 94 secondary schools for Ottoman Christians with 140,000 pupils in total, a figure that vastly exceeded the number of Muslim children in school at the same time, who were further hindered by the amount of time spent learning Arabic and Islamic theology. In turn, the higher educational levels of the Christians allowed them to play a large role in the economy. In 1911, of the 654 wholesale companies in Istanbul, 528 were owned by ethnic Greeks.